The best way to the bottom line is through the heart. 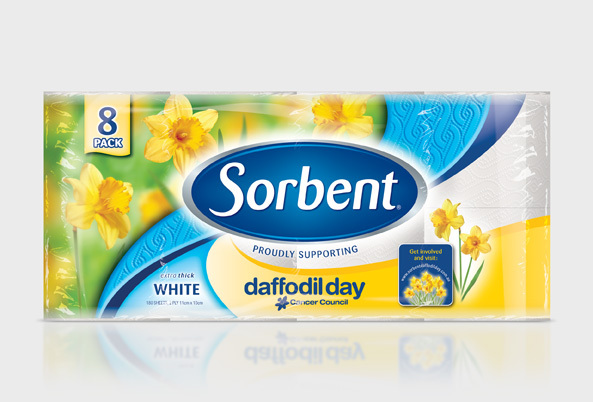 Our packaging redesign for Sorbent Toilet Tissue returned this iconic Australian brand back to its number-one market position. Photographic imagery of calming nature scenes lend a high-end contemporary look whilst rebuilding consumers' emotional ties and loyalty to the brand. 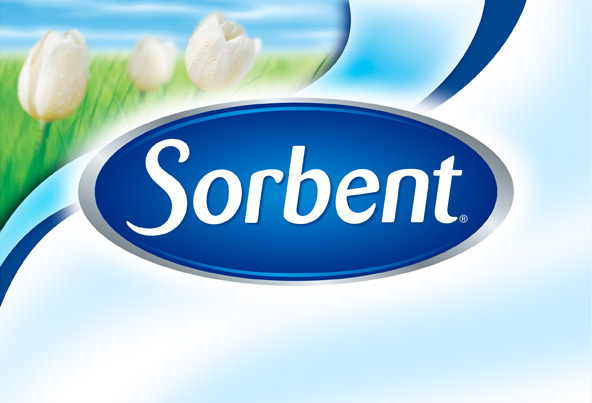 The updated ribbon device flowing behind the familiar Sorbent logo provides an evolutionary link to previous packaging. Sometimes it takes a special touch. 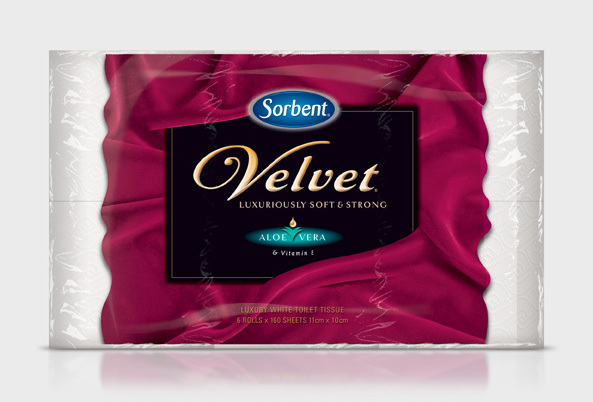 That's what our packaging design brought to the Sorbent brand for its luxury Velvet facial tissue. 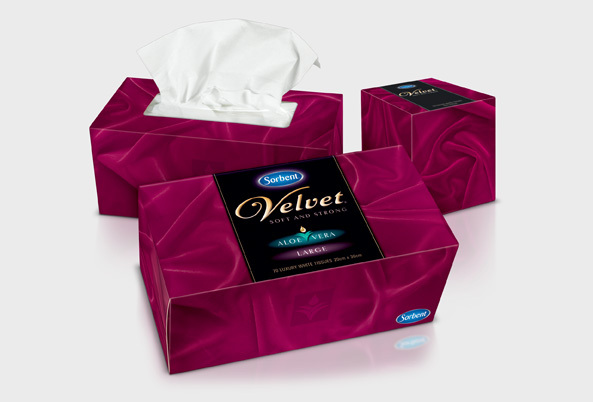 Our touch was so special in fact that the company established an entire range for the Velvet sub-brand and expanded into the toilet tissue category. 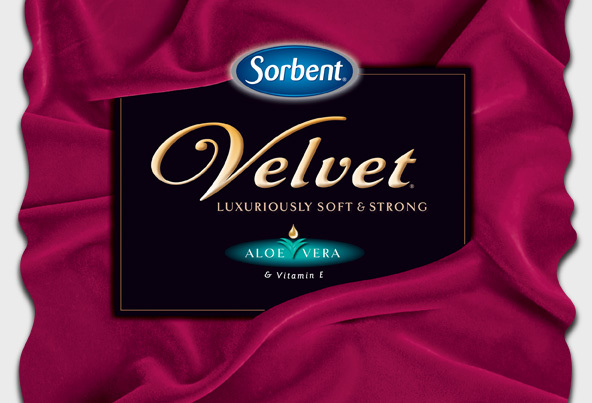 To support its positioning as a soft, premium product that brings luxury and pampering to the every day, we chose a rich background of draping fucshia velvet overlaid with gold-embossed typography. 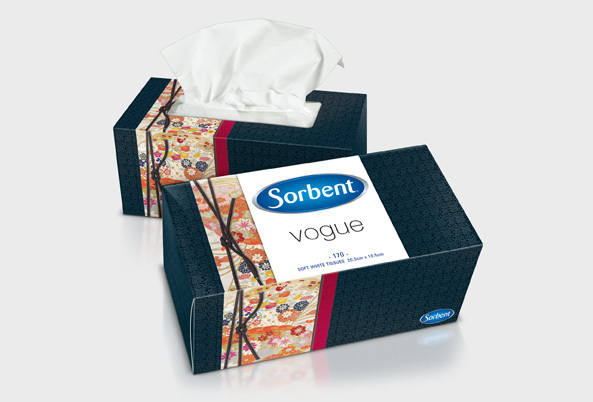 The sophisticated black-coloured panel and swirled "V" carry smoothly across both tissue categories, conveniently drawing attention on shelves. It's our business to think outside the box. And we've read the research: consumers who purchase facial tissues are not just buying a practical product—they're also making aesthetic decisions for their homes. 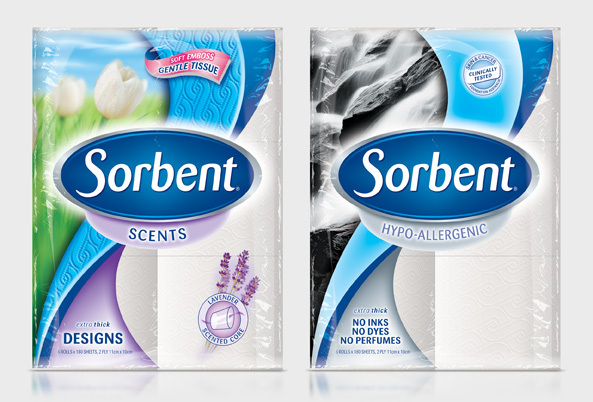 Our latest evolution to the Sorbent facial tissue ranges includes a bold and striking coloured brand panel. 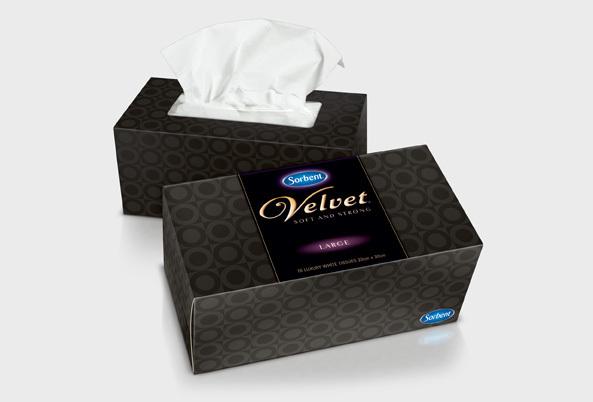 For the premium Velvet variant, black was the obvious choice to connote richness and luxury. With designs like these, no one feels boxed in. 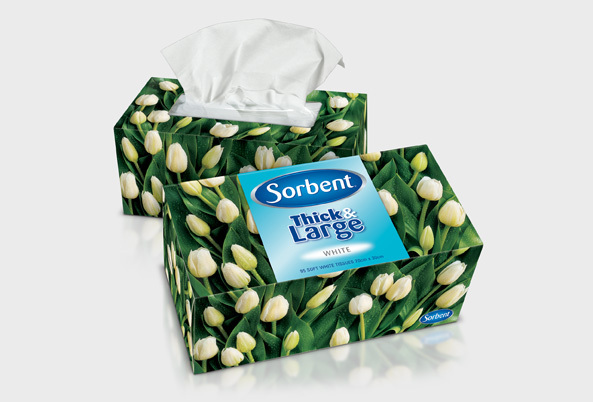 Some of our most iconic and best-selling packaging concepts promote the Sorbent Thick & Large facial tissue variants. 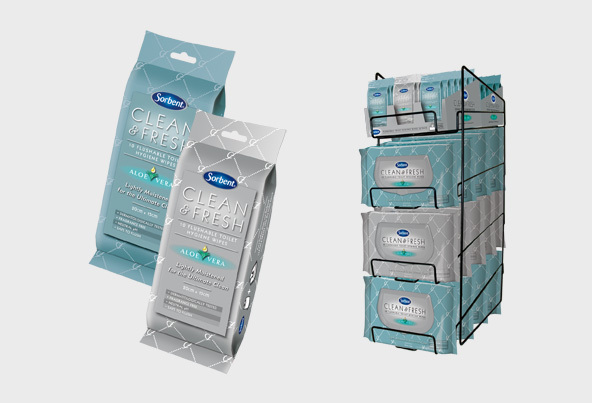 A serene blue brand panel lends a conspicuous shelf presence whilst also providing a cue to good health. In a world dizzy with hyperbole, it can be a relief to get some straight talk. 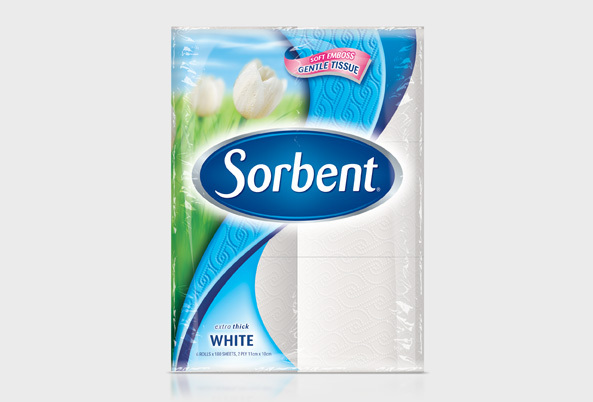 A clean white brand panel for the Sorbent Everyday facial tissue demonstrates its positioning as a reliable, everyday choice. Without the fuss, white provides strong shelf-blocking and allows some of our most iconic designs to speak for themselves. Go ahead. Take it personally. We do. That's one reason our packaging upgrade for Sorbent Clean & Fresh personal wipes rescued the product from obscurity and increased its market share by 25%. 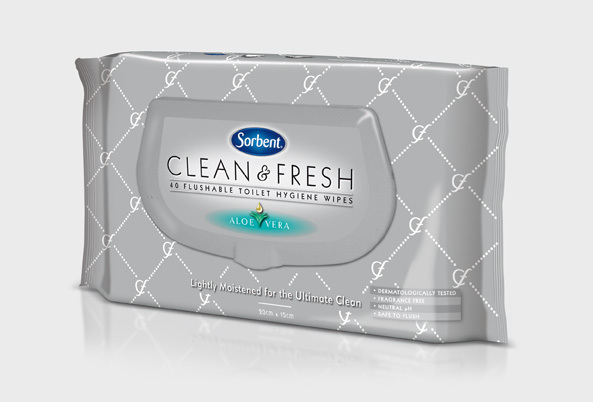 Packaging chic was essential to repositioning this product as stylish enough to display in a bathroom as in a handbag. The brand-reinforcing monogram pattern strikes that highly personalised touch and mimics the silky lining of upscale purses. The brand mark and silver tones project a clean, modern feel that appeals to a unisex adult market.